Here are some books from the Montclair collection about national parks and the people who helped found them. The Camping Trip that Changed America: Theodore Roosevelt, John Muir, and Our National Parks by Barb Rosenstock (J 979.447 ROSENSTOC) – Offers insight into the camping trip that President Theodore Roosevelt and naturalist John Muir took to the redwoods of Yosemite in 1903, during which the two men had experiences and conversations that eventually contributed to the establishment of national parks in the United States. Squirrel and John Muir by Emily Arnold McCully (J PICBK McCULLY) – In the early 1900s, a wild little girl nicknamed Squirrel meets John Muir, later to become a famous naturalist, when he arrives at her parents’ hotel in Yosemite Valley seeking work and knowledge about the natural world. Yellowstone Moran: Painting the American West by Lita Judge (J BIO MORAN) (not at Montclair) – Tom Moran had never ridden a horse or slept under the stars before, but the paintings he created on his journey from city boy to seasoned explorer would lead to the founding of America’s first national park. Redwoods by Jason Chin (J PICBK CHIN) – While it’s not specifically about national parks, this book does highlight the star attraction of some of our Northern California national parks. In this book, a young city boy riding the subway discovers an abandoned book about redwoods and finds himself in the forest. Everglades by Jean Craighead George (J 975.939 GEORGE) – Describes the Florida Everglades, the evolution of this unique area, and the impact humans have had on its once-abundant life forms. 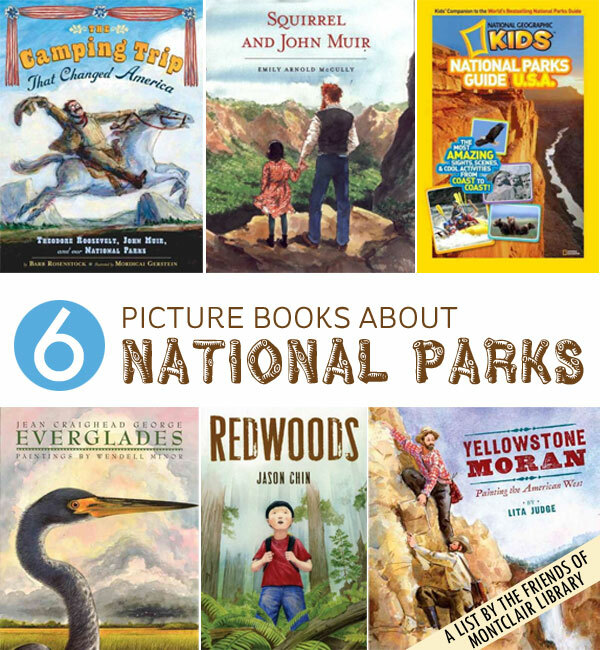 National Geographic Kids National Parks Guide U.S.A.: The Most Amazing Sights, Scenes, and Cool Activities from Coast to Coast (J 917.304 NATIONAL) – A guide to America’s national parks, including tips on exploration, information about animals and fun facts. The National Parks: America’s Best Idea by Dayton Duncan (Oversize 333.783 DUNCAN) – This companion book to the Ken Burns PBS miniseries about America’s national parks is packed with photos and history. Your Guide to the National Parks by Michael Joseph Oswald (917.304 OSWALD) – This guide to the United States’ national parks features detailed maps, images and hiking tables for each site, and offers advice on the best places to bike, camp, hike, lodge and perform water and winter activities. The Official Guide to America’s National Parks by National Park Foundation (917.3 OFFICIAL 2013) – Contains brief profiles of America’s national parks, arranged alphabetically by state and territory, providing contact information, directions and details on fees, hours, regulations, sights to see, activities, food, lodgings and supplies.